The literary contributions of Jimmy Faulkner  the nephew of William Faulkner, son of John Faulkner, and great-great-grandson of the Old Colonel, Col. William Clark Falkner  can best be described as story-teller, particularly about his family. He was born James Murry Falkner in Oxford, Mississippi, on July 18, 1923; later, he followed his uncle and fathers examples and changed the spelling of his name to Faulkner. (His brother, Murry Chooky Falkner, continued to spell it the old way.) Much of his childhood was in the presence of his uncle, immersed in the local culture and familiar with the same people, places, and customs his uncle would transform into his fiction. During World War II he was a Marine fighter pilot in the Pacific, where his plane was shot down. He later flew combat missions in the Korean war as well. In 1947 he earned a B.S. degree in engineering, and from 1955 until his retirement in 1983, he operated a construction company. After William Faulkners death in July 1962 and his own father's death the following year, Jimmy became the head of the Faulkner family and the more-or-less de facto spokesman for the family. He has saved, collected, and preserved a number of family heirlooms, including the dining room table, walking canes, and a pocket watch that belonged to the Old Colonel. His antebellum home near Oxford was designed by the same architect who built William Faulkners home, Rowan Oak, and he carried on a number of family traditions, such as curing meat and canning fruits and vegetables. Faulkner frequently was called upon to give talks and answer questions about the Faulkner family, particularly William Faulkner, whom he always referred to as Brother Will. In addition to collecting and talking about the fiction by his uncle, he has even lived it, playing the role of Major de Spain in a 1980 American Short Story Collection production of Barn Burning for PBS. Faulkner died on Dec. 24, 2001, at a hospital in Tupelo, Mississippi. Photos by Billy Howard appear in the book Talking about William Faulkner, listed below. 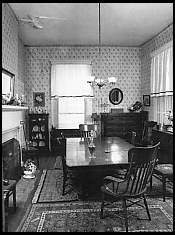 Jimmy Faulkner's numerous family heirlooms include this dining table owned by his great-great-grandfather, the legendary William Clark Falkner. Across the Creek: Faulkner Family Stories. Jackson: University Press of Mississippi, 1986. Brother Wills Passing. Southern Living (March 1992): 108-09. Wolff, Sally, with Floyd C. Watkins. 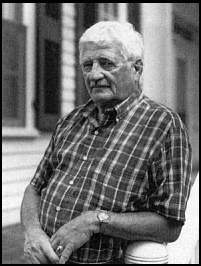 Talking about William Faulkner: Interviews with Jimmy Faulkner and Others. Baton Rouge: Louisiana State University Press, 1996. This page has been accessed 3077 times. About this page counter.